Location: 37070 St. Mary St. Comments: Broadleaf monsoon deciduous tree native to Australia. Monsoon deciduous trees lose leaves in the summer rather than winter, but because of our mild summers, not many leaves are lost. 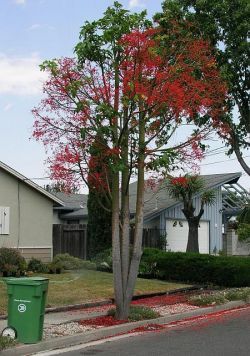 This species has maple-like leaves which are highly variable in shape, but bright scarlet red flowers and stems are a key feature. Mature trees to 40' with green bark and a buldgy trunk.